Based in San Francisco, Guided Safaris, Inc. is an internationally-recognized luxury brand in the world of bespoke safaris that support some of Africa's most important conservation projects in off-the-map ecological hotspots. ‘Journeys of a Lifetime’ is both the Guided Safaris conservation initiative and the foundation stone of our entire ethos and operation. Since 1995, the eco-luxury safari brand has supported philantropic initiatives that link to an immense variety of wildlife management and research projects in Sub-Saharan Africa addressing the ecology of existing wildlife population and sourcing solutions to save endangered species, as well as lending a hand in community-upliftment by way of education, nutritional solutions, healthcare and vocational development for the indigenous cultures in these incredibly remote, wildlife-rich regions. “It was truly an outstanding trip. We had a fabulous time at Mombo. Great Guide Moss. Saw all Big 5 in a.m. of the second day…had a great wild dog chase..Impala, wilddogs, hyenas, ourselves in Camp Vehicle racing across the plains..while the lions just watched at the whole thing! (The impala got away). Also got to see a cheetah, and both Pula and Blue Eyes leopards – 2 times. Loved what they were doing for the Rhinos. Sited one of the Black ones..very rare. Abu was very different. We were very fortunate to be there when the tested Paul Allen’s first Drone, over our outdoor movie theatre, to see if it would pick up the fires..which is what they are hoping will zero in on Poachers. We stayed in Unit two, Jody Allen’s unit..fabulous. I am proud an American, Paul Allen, who owns the 465,000 acres, is trying to use technology to stem the killing of those fabulous creatures. Two books to read: The Elephant Whisperer..heard about it there, and Elephant Company.. Here is the picture of the Black Rhino sited at Mombo Camp on Sep. 28 and Pula, sighted on the 29th, and then with her Kill in the tree. Just a few of the many great pictures, and many great experiences. 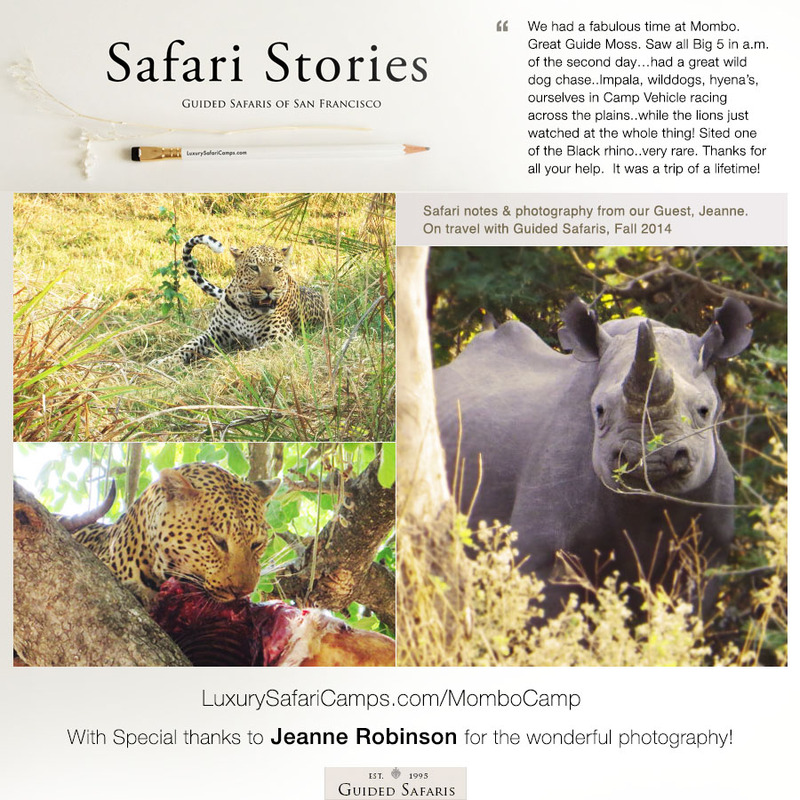 The Original Guided Safaris® Collection of Luxury Safari Camps & Lodges. Copyright © 2014 Guided Safaris Inc. All rights reserved.